Who Our mixed-age primary classrooms contain children ranging in age from 3 years by the end of August (and functioning independently with toileting) to 6 years for Kindergartners. When Primary children may either attend the morning or the afternoon session. The morning session begins at 8:15 AM and ends at 11:15 AM, and the afternoon program is from 12:15 PM to 3:15 PM. Kindergartners attend a mixed-age session starting at 8:15 AM and remain until 2:15 PM for an extended session. Practical Life, which is filled with activities designed to help young children learn how to successfully manage their environment. The Sensorial Area, which contains carefully designed materials each of which introduces a particular physical quality perceived by the senses, and used to describe and categorize the world, such as color, dimension, and weight. The Language Area, which capitalizes on young children’s natural sensitivity to the human language which surrounds them. Teachers expose children to all kinds of rich oral language, as well as introducing them to materials designed to give them the tools for developing and practicing writing and reading. The Math Area, which is filled with materials which give children years of practice working with concrete manifestations of abstract mathematical concepts, like linear counting, the decimal system, geometric shapes, and mathematical functions. 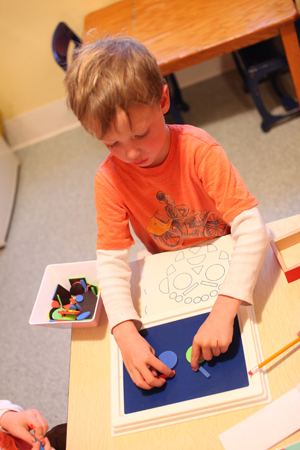 The math materials build on the child’s experience in the Sensorial Area. The Cultural Subjects, which include art, history, geography, music and science. Because these areas are so open-ended and filled with possibilities, we coordinate our studies in the cultural areas between each classroom and the art studio, striving to not only give children accurate factual information, but also allowing them time and a place in which they might develop their own creative ideas.